La traduzione inglese (a cura di Simon Leys) del celebre saggio di Simone Weil sulla soppressione dei partiti politici. ‘Political parties are a marvellous mechanism ... 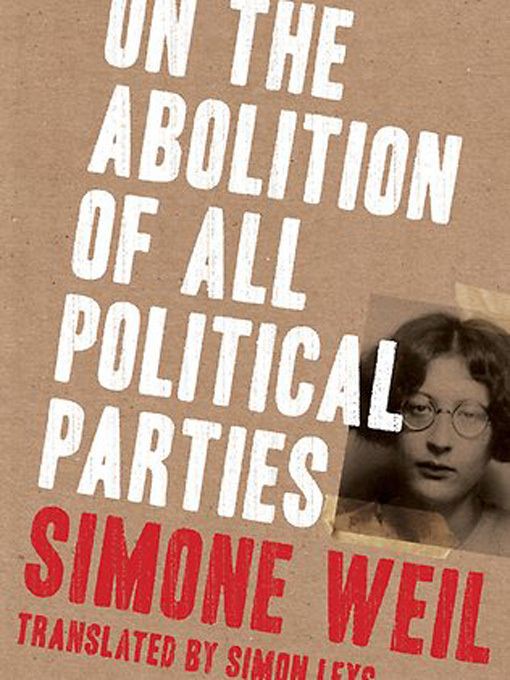 If one were to entrust the organisation of public life to the devil, he could not invent a more clever device.’ Here Simon Leys translates for the first time into English an essay by the remarkable Simone Weil – philosopher, activist, mystic – which makes a case for the corrupting effect of political parties on political life, and calls for their abolition. This is a dazzling account of the perils of political conformity, written with brilliant clarity and wit. It is combined with an essay by the Nobel Prize-winner Czeslaw Milosz ‘on the importance of Simone Weil’ and an essay by Leys on the influence of Weil, especially on Albert Camus. The result is a jewel-like volume which showcases some of the finest minds of the last century. Libro edito da: Black Inc.